Cambridge, MA, February 24, 2011 — The Turkish Academy of Sciences (TUBA) has launched a site containing Turkish translations of 16 MIT OpenCourseWare (OCW) courses, becoming the sixth OCW translation affiliate. The initial publication includes Turkish versions of MIT math, chemistry, physics, and earth, atmospheric, and planetary sciences courses. Several dozen more translations are forthcoming. TUBA has produced the translations with its own resources. MIT OpenCourseWare materials are published under a Creative Commons license that permits users to download, modify and redistribute content for non-commercial purposes, provided they cite MIT relevant faculty as the source of the content and any derivatives—including translations—are made available under an identical license. This license permits any site user to make and publish translations. OCW translation affiliates, whose translations are linked to from the OCW site, have undergone a quality assurance review by the OCW staff. The Turkish Academy of Sciences joins Universia (Spanish, Portuguese), China Open Resources for Education (Simplified Chinese), Opensource Opencourseware Prototype System (Traditional Chinese), Chulalongkorn University (Thai) and Shahid Beheshti University (Persian) as MIT OpenCourseWare translation affiliates. Together these organizations have created more than 900 translations of OCW courses. These translations have received more than 33 million visits to date, accounting for roughly 40% of worldwide access to MIT OpenCourseWare content. Translations of OCW content are part of MIT OpenCourseWare’s efforts to reach a billion minds in the next decade. The Turkish Academy of Sciences is an autonomous body which determines its organizational structure and activities on the principle of scientific merit. Its aims are to establish the criteria of scientific excellence in Turkey, to encourage and foster scientific endeavors, to ensure that scientific principles be applied in all spheres and to create an environment of debate so that basic social strategies may be defined in the light of scientific and technological data. The Academy strives to promote adoption of and strict adherence to scientific ethics both by its own members and by the whole of the Turkish scientific community; freedom of expression; culture of debate and the integration of the Turkish science with the international scientific community. An OpenCourseWare is a free and open digital publication of high quality university-level educational materials—often including syllabi, lecture notes, assignments, and exams—organized as courses. While OpenCourseWare (OCW) initiatives typically do not provide a degree, credit, or certification, or access to instructors, the materials are made available under open licenses for use and adaptation by educators and learners around the world. MIT OpenCourseWare (http://ocw.mit.edu) makes the materials used in the teaching of substantially all of MIT’s undergraduate and graduate courses—more than 2,000 in all—available on the Web, free of charge, to any user in the world. OCW receives an average of 1.5 million web site visits per month from more than 215 countries and territories worldwide. To date, more than 100 million individuals have accessed OCW materials. Cambridge, MA, Feb 22, 2011 – As the tenth anniversary of the announcement of MIT OpenCourseWare (OCW) approaches, MIT has set an ambitious agenda for the program’s next decade: reaching one billion minds. In the past ten years, MIT’s course materials have been accessed by millions of individuals around the world through its groundbreaking OpenCourseWare program. By any measure, MIT OpenCourseWare’s impact has exceeded the expectations of the faculty who first proposed the effort, tapping into a vast reservoir of unmet educational need worldwide and revealing the promise of even greater impact to come. As MIT looks to OpenCourseWare’s next decade, the program seeks to deliver on that promise. 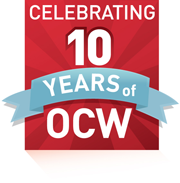 Read more about OCW’s anniversary and future plans. On April 4, 2001, MIT announced Institute would share the core academic materials—including syllabi, lecture notes, assignments and exams—from all of its courses freely and openly on the web, providing resources that educators and learners could use to improve a wide variety of formal and informal educational experiences. In the ten years since, more than 80% of MIT’s faculty members have voluntarily shared their teaching materials through OCW, amassing a collection of over 50,000 individual resources including documents, video, audio, simulations, animations and sample programming code drawn from over 2,000 courses. An estimated 100 million individuals have accessed these resources, and hundreds of universities around the world have joined MIT in sharing their own course materials freely and openly on the web. In the coming decade, MIT OpenCourseWare will continue to publish MIT’s core academic materials—making the OCW site deeper and richer—and will also undertake a series of initiatives designed to magnify the impact of the program through a focus on four key areas of innovation: First, OCW will continue to collaborate to make OCW’s materials widely available on the web through affiliate sites and mobile channels; second, OCW will undertake projects to make the materials more useful to key audiences; third, OCW will seek to create communities of open learning around MIT’s content; and finally, the OCW team will focus on making the content more adoptable and adaptable for educators everywhere, helping them to share OCW content with their students. MIT OpenCourseWare has already begun launching a series of projects developed out of the innovation framework, collectively called OCW’s Next Decade Initiatives. Last September, OCW launched a series of study groups associated with OCW courses in collaboration with OpenStudy. In four months, these groups have attracted more than 12,000 participants. In January of this year, OCW launched the first of a new series of courses, dubbed OCW Scholar courses, designed to meet the needs of independent learners by providing more complete content and logical sequences to facilitate learning. OCW also recently announced a new iPhone app, OCW LectureHall, that provides an enhanced experience for viewing OCW lectures on that platform. These efforts join Highlights for High School, a site OCW launched in 2007 to help US high school educators and students better use OCW resources. In May of this year, MIT will cohost the annual meeting of the OpenCourseWare Consortium on the MIT campus, welcoming 300 representatives of leading OCW programs from around the world. MIT OpenCourseWare makes the materials used in the teaching of substantially all of MIT’s undergraduate and graduate courses—more than 2,000 in all—available on the Web, free of charge, to any user in the world. OCW receives an average of 1.5 million web site visits per month from more than 215 countries and territories worldwide. To date, more than 100 million individuals have accessed OCW materials. While we haven’t yet conducted a survey to gather detailed feedback about the new OCW Scholar courses, we do have one month of analytics now, and the results look pretty good. Collectively, the five courses received just of 95,000 visits in their first month, and all are in the top 30 courses on the site for the period January 12 to February 12, 2011. The Top courses, 18.01SC, received just under 28,000 of those visits. More data as it becomes available. As we approach the celebration of MIT OpenCourseWare’s 10th anniversary, we’d like to share our users’ stories of OCW’s impact in their own words. Record and upload a video describing your OCW story to YouTube and e-mail us at ocw-outreach@mit.edu to let us know where to find it. We’ll be selecting user videos for inclusion on the 10th anniversary section of our site. So, as promised, a few thoughts on Unlocking the Gates, Taylor Walsh’s examination of online courseware (to use her term). I’ve taught enough writing to understand that telling a story like this is largely about the creation of a false coherence through the imposition of narrative structure, and is as much about omission as about what is included. In other words, it’s a sensemaking exercise. Taylor’s book is a valuable introduction to the field and the key issues, and most of the critiques I have are along the lines of what gets lost or obscured in the telling of any story, rather than things I think are wrong or ought to have been addressed differently. First, by virtue of the projects selected, the book makes online courseware seem like the province of elite institutions, and at least in the OCW world it’s simply not the case. After the launch of MIT OpenCourseWare, the next OCW to go live was the Fullbright Economics Teaching Program OCW in Vietnam (which has been posting content as long as we have). A quick look at the list of OCW Consortium members will reveal a collection of schools working at a variety of levels and serving a variety of audiences, which together have published an enormous amount of material (12,000 courses excluding MIT’s). Many of the discussions in the book would have been much richer with an examination of why these schools are publishing their content openly. What is also obvious from looking at the OCWC membership list is that it’s a very international movement. The chapter on NPTEL is really valuable, and does a great job of illustrating how NPTEL is not a follow-on to OCW but a thoughtful application of technology and open sharing to a local educational problem. By virtue of the projects selected again, however, the book is weighted to US (and British) efforts, whereas the OCW movement has huge centers of gravity in IberoAmerica, Asia and other regions. The book would have been significantly enhanced by more attention to these efforts, including the enormous effort in China to publish courseware in support of the educational system there. Fortunately, Stian Haklev has written an excellent thesis on the subject, which I recommend as an additional reading for anyone reading Unlocking the Gates. I do think the analysis of the value of the projects is fairly one-dimensional, focused narrowly on the subject of student learning, largely because this is where the projects overlap and because this is the most measurable of impacts. Fair enough to say that MIT OpenCourseWare is not the ideal tool to support student learning and that OLI is better designed to meet this need, but students moving through OCW materials as though they were taking a course is a very small portion of our overall use. OCW is used as an educational reference resource more than as a set of online course one can somehow “take” and demonstrating value needs to take account of a wide range of uses. Which is what makes it hard. But lines have to be drawn somewhere in doing this kind of work and certainly this was a tremendous effort on Taylor’s part and it’s a huge contribution to the field. One small thing that is factually wrong is the level of effort that goes into MIT OpenCourseWare’s media relations–Taylor indicates that OCW “employs two full-time external relations professionals” charged with dealing with the media. Not the case. I am External Relations Director, and I have an External Outreach Manager, Yvonne, that works with me. Yvonne spends the bulk of her time managing analytics reporting, our mirror site and translation programs, and running out visitor donations program (which she does very successfully). She rarely interacts with the media–only in a pinch if I am unavailable. I do work with media, by it’s maybe 20% of my time, if that. I manage our program evaluation, oversee significant portions of our other fundraising efforts, manage relationships with a portfolio of prospective and current collaborators, and spend a chunk of my time on duties related to the OCW Consortium. I also think that the purpose of the media efforts is misidentified in the book–it’s really not to improve MIT’s brand; MIT gets plenty enough positive news coverage as it is. We were charged by the MIT faculty with producing the greatest benefit possible out of their gifts of educational content, and that means making as many people as possible aware of OCW. Awareness is right in the wheelhouse of our core mission—generating global benefit. The secondary aspect is that our sustainability will depend on growing our audience to the point where visitor donations are a significant revenue stream and we reach enough people to make corporate underwriting attractive. Certainly MIT as a whole benefits from the positive press, but lots of amazing people do amazing work here—MIT could get more bang for the buck highlighting that work than inventing a whole program like this to trumpet. Plus, as I’ve often said, MIT could likely have gotten the same PR benefit from publishing 200 courses rather than 2,000. I guess the reason this bothers me (after all, I should just shut up and take credit for it) is that saying that MIT’s success is the result of savvy marketing diminishes importance of the faculty’s content and the value our audience finds in it. OCW is a program that markets itself because it provides content and educational opportunities that people truly value–it’s a story that tells itself. My job in working with the media is largely to not mess up telling the story. …In the right meter, and in combination with the right experiences, an education is sufficient to lift a person into a life of self-awareness and reflection. It is the great liberator, and even should an educated person never rise out of poverty, that person will never again be poor. John Stuart Mill said that the principle of liberty is the right of each person to pursue their own good, in their own way. …He understood that the highest principle of liberty was in fact both the right and capacity to actually define one’s good, to freely chose one’s ambition and purpose in life, and to enact the means and mechanisms to carry it out. Freedom is not merely the absence of restraint, but the right to live meaningfully. An educated population is probably the least governable, the most likely to rebel, the most stubborn and the most critical. But it is a population capable of the most extraordinary things, because each person strides purposefully forward, and of their own volition, together, they seek a common destiny. I’ve had my share of existential moments, but this is one I didn’t realize I was having. Or rather my profession was having. I like Taylor’s book for the most part, and think it serves as a useful examination of the field, but I do think it does miss on a couple of fronts, which I will discuss in later posts. But for now, the soundbite: Ira Fuchs quote “If you take away OCW completely, I’m not sure that higher education would be noticeably different.” Sure, especially US higher education. The same could be said of Wikipedia. And once again I am filled with the sense that as a movement, we are failing to adequately define success and so leaving ourselves open to having others define it for us. When OCW was announced, I think there were many out there who hoped it would provide the leverage to break away from the artisan model of teaching to something that was more scalable. There seem to be two varieties of this hope: One that, faculty around the world would just pick up and use MIT’s curriculum, saving time and improving quality in one fell swoop (the “dirty underwear” model); two, that OCW would repeat Wikipedia’s success and that teachers around the world would collaborate on one “killer app” curriculum. A third variety that emerges in Taylor’s book is that online resources might supplant live teachers entirely-the OLI model. All three I think grow from a view of education that holds it is essentially knowledge transfer, and that there ought to be one “best” way to do it, measurable and precise. Education, at least for me, is intensely local and personal, learning how to learn. I won’t dwell, and plenty of people have spoken more intelligently and articulately on the issue. Comments like Ira’s I think express the frustration of revolutionaries expecting a revolution. OCW by its nature, though, reinforces the artisanal model of education by providing an example of one of the best artisanal communities of educators in the world hard at work. When we were first going to faculty and encouraging OCW participation, one of the constant refrains we heard was that MIT’s materials were designed for MIT students, and likely weren’t going to be appropriate for most people out there. Not that they were necessarily too high level, just that they were created for a specific community working with in specific conditions. However, OCW materials do provide educators a window into how the MIT faculty community operates, how they craft educational experiences, and other craftsmen and women around the world can draw inspiration and resources from OCW as they create their own educational experiences. But this is not the kind of activity you see writ large on the face of institutions. Nor does it change the fundamental model. Large parts of the OCW story also take place outside the walls of institutions as well, offering educational opportunity to people who previously had none, and Ira’s comment completely ignores this issue. OCW has the potential of impacting a great many lives, and appears at some level to have already done so for hundreds of thousands. But this is a difficult story to document and tell, not measured in pre-tests and post-tests. Which doesn’t mean we shouldn’t be doing it, it just means we have a lot of hard work ahead of us. This again is not a post about Ira Fuch’s comment, it’s a post about our own failures to make the case. To define success. To share what we know about the ways OCW is making a difference around the world. Ira’s right, we haven’t noticeably changed higher education. But we have noticeably changed lives all around the world, and we need to be getting that message out there. CAMBRIDGE, MA, February 4, 2011 — Today, MIT OpenCourseWare announced the release of the new OCW LectureHall iPhone app, which utilizes Irynsoft LLC’s VIRT2GO platform to make viewing OCW lectures a social experience in which users can update and keep tabs on their Facebook friends, post to a forum, and leave ratings and reviews of individual videos. Users can also download video for offline viewing as well as take notes and conduct web searches while watching video. The LectureHall app is available through the iTunes Store. The beta version of LectureHall has been available on the iTunes App Store since July 2010, and has already been downloaded over 10,000 times. Irynsoft is also working on an Android version of the LectureHall app, expected to be released in the summer of 2011. The LectureHall app is part of a larger effort by MIT OpenCourseWare to distribute MIT’s course materials more widely. In addition to this mobile platform effort, MIT OpenCourseWare also distributes course materials on hard drives to bandwidth-constrained regions; through translation affiliates; and through distribution affiliates including iTunes U, YouTube, the Internet Archive and Videolectures.net. Irynsoft is a software and services company that is focused on mobile and web technologies, based in the Bay Area of California and was established as an LLC in late 2009. Irynsoft’s primary business is to provide a platform for educational institutions and companies to deliver content and social collaboration services on mobile devices. The platform (VIRT2GO) is an interactive mobile learning platform where you find and “attend” lectures & collaborate among a social network of peers, all within a rich smartphone interface. With VIRT2GO’s portability & community, students overcome the biggest hurdles that impede online educational success: finding the time and finding the help.